The uproar over politics has had me in a bit of a whirlwind of emotion. My own family, split in our decisions over who we are voting for President. My carnal self fights the belief that a person with any sort of sound, moral, Godly judgment would vote the way I am voting. It has been an internal battle I am ready to say farewell to and not see for a very long time… I mean never. I do not know much about politics and though I try to do my research on candidates and vote how I believe God is leading me, I cannot claim to fully understand how it all works. For that reason, I rarely weigh in on politics and I’ve never used this platform to do so but this isn’t really about politics anyway. It’s about truth. And we all know truth is not seen so much in politics, unfortunately. Here’s truth: There are good people, truly seeking God in their decision, who are voting for Trump. There are good people, truly seeking God in their decision, who are voting for Clinton. There are good people, truly seeking God in their decision, who are voting for anyone else other than Trump or Clinton. This has been a hard thing for me to come to terms with but as I look at my own circle of friends and family, I know without a shadow of a doubt, this is true. In my immediate family, I believe all the candidates are covered! Just because someone is voting for a particular candidate of whom you do not approve (or may even think is evil), does not mean they are evil, immoral, or not a Christian. Satan loves the dissension he is creating between family members, church family, and society. We are seeing more ugly words being spewed towards each other and fights on social media than I’ve ever seen before. Personal attacks on character because of political opinion are plastered all over the walls. And Satan loves it. Ironically enough, in our attempt to stand up for what’s right and stand up for the issues that we believe in, we are tearing each other down. We are hurting relationships and we are hurting our witness. In many instances, we do not appear any different than the world, saying the same things as everyone else, in the same way, and spouting off at our brothers and sisters in Christ. Can you imagine the effect we would have on our country if we all were as passionate about following Christ as we are politics? What if we had as much belief in God that He is able to transform our world and perform miracles as we do the next President being able to affect our country? What if we pursued God in prayer and shared His message as passionately as we destroy candidates on Facebook? You might believe that you are following Christ by being passionate about politics and trying to influence others to vote for the one who you believe aligns more closely to Biblical standards and I can see that and understand it. But there are so many other avenues through which God can move and work through us! Here’s an idea for us to consider: What if God is giving us an opportunity to stand together, despite differing opinions, and rise up to be the Church He created us to be? 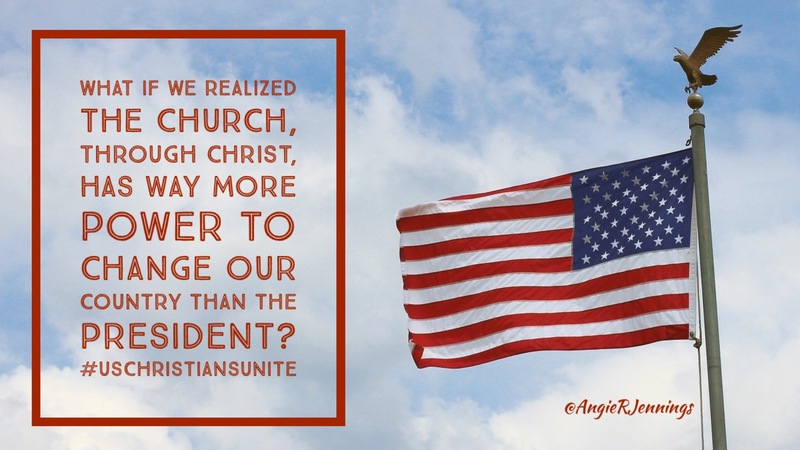 What if we realized that the Church, through Christ, has way more power to change our country than the President? And what if we acted on that belief? This would be something that would make others pause and take notice. This would be a way we could stand up and stand out from what the world sees on a daily basis. This would be a way for us to be “set apart” in a way that brings light and encouragement to others. I’d love to see people on social media start making statements like “My good friend, ______, is voting for (a person I’m not), but I know she’s seeking God in this decision and is a wonderful person. We may disagree but I love her and think the world of our friendship. And both of us know that ultimately, God is in control. #USChristiansUnite”. Of course, there are many private people so we wouldn’t want to share that without consent. But can you imagine the statement we could make?!! We have 3 and a half weeks until the election. I highly doubt anyone is going to change their mind at this point. What do we have to lose?